This is the UAV Development Board v3 (aka, UDB3). 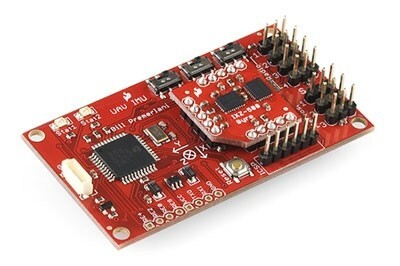 The UDB3 board comes with a dsPIC30F4011 CPU, an MMA7260 three axis accelerometer, and two dual axis IXZ500 gyros (instead of three LISY300AL gyros with v2). The IXZ500 gyros have enough vibration tolerance to be used in RC heli applications. 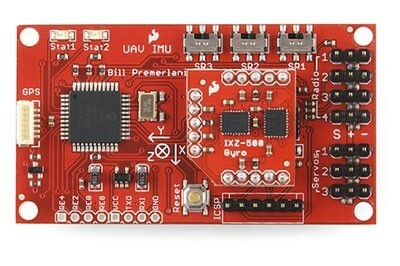 By itself, the board can be used to develop a three axis IMU controller. With the addition of an EM406 GPS receiver it can be used to develop a UAV controller for an RC car, plane, helicopter, or boat. It comes with self-testing firmware that can serve as a starting point for you to develop your own control and navigation firmware. There is also fully functional, open source autopilot firmware available. The board also supports a connection to the faster and more accurate UBlox GPS module. If you have a GPS unit already the easiest way to connect to the GPS is with this adapter. We suggest using the PICkit3 to program the board. Note: On the 6 pin debug header, the pin next to the reset button is VPP, according to this convention. UPDATE: Matrix Pilot 3.2 has been released! Dimensions:1.5 x 2.75 x 1.0"